ConsignPro Support, the best in the business! Tech Support is available from Monday – Friday, 9am until 5pm. Saturday, 10am until 2pm (EST). Our Support phone number is: (305) 535-0959. After hours and weekend emergency support is also available. To intiate emergency support, please e-mail us at 911@consignpro.com. An emergency is defined as not being able to open ConsignPro or make sales when your shop is open for business. Non-emergencies are everything else. The annual support cost is based on the number of copies of ConsignPro you run in your shop. Version Updates are also included in your Support Plan purchase. We send out e-mail reminders when your Plan expires or you can renew online. The Support Plan is optional, but you won't receive Support unless you are enrolled in our Plan. Enroll in our auto-billing program and we'll automatically renew your Support Plan when it becomes due and email you a receipt. You'll also receive a $5 discount on every renewal! 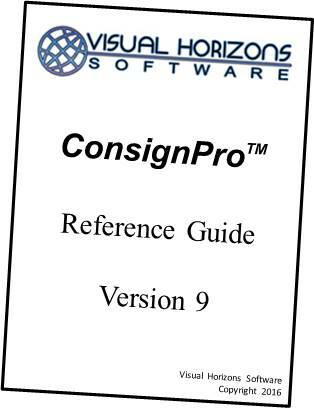 Our ConsignPro User Guide provides detailed and complete information about the ConsignPro program. Click the link below to download the User Guide. The guide should open in a new window, in which case you can click the "Disk" icon to save it to your computer, or the "Printer" icon if you'd like to print all 142 pages. On some computers, the Guide may download automatically, in which case you can open it in Microsoft Word (which must be installed on your computer). We have many ConsignPro training videos available on YouTube. Each of the ten-minute "modules" will train you on a different part of the ConsignPro system. Be sure to "subscribe" to our "channel" so you'll always be notified when we release a new video. Below are some utilities that our Support Team may ask you to use. Team Viewer Run this utility to allow us to remote into your computer to solve problems. Crystal Reports 4.6 This editor allows you to edit ConsignPro reports and tag & label designs. Crystal Read-Me This PDF guide gives you tips on using the Crystal Reports editor. Crystal Tag Names This spreadsheet is used to help you identify the tag file name that corresponds to the tag or label that you are using. Barcode Manual This PDF guide contains barcodes for resetting your barcode scan gun. newdb.exe This file contains an empty or initialized ConsignPro database. It will erase all data in ConsignPro. newini.exe This file contains an initialized ConsignPro ini file.